A stroke is among the most disconcerting and disabling afflictions we humans are likely to encounter. Joel Deane, poet, speechwriter, novelist, had one in 2012 and Year of the Wasp is his three-part, book-length poem recounting that event and his recovery from it. Although there are details of the wards, the nurses etc Deane has preferred to find “objective correlatives” for his suffering and so has, in effect, mythologised the experience. The mythology he uses is mainly classical but some allusions range more widely. While such a decision can frustrate the reader’s desire for medical and rehabilitative detail, it also generates a forward momentum so that the poem threatens almost to break free of the author’s control. Given that lack of control is the defining feature of a stroke, Deane’s strategy is not inappropriate. The metaphorical energy employed in Year of the Wasp also reminds one of Luke Davies’ long poem, “Totem”, though that was essentially a love poem and this one is about pain (though love does intrude). A willingness to forgo literal coherence in favour of metaphorical intensity also goes back to the American poet, Hart Crane (1899-1933) in his “Voyages” and “The Bridge” sequences. It’s a fine, sometimes risk-taking, tradition. Deane starts the title sequence clearly enough — and with a distinctly country-Victoria atmosphere: “South of Shepp / the Renault punched a hole / the shape of the first man / in a storm of locusts. / Confirming the irrigation flats / as God’s chosen wasteland.” It’s a characteristic mixture that continues through the rest of the book. The event (the stroke, though we are not told that at first) takes place south of “Shepp(arton)” but already we are in the Old Testament with locust plagues and a looming Jehovah. Later the gods will be classical, rather than the Jewish one, but we know the terrain we find ourselves in. Another instance of Deane’s mythologising can be seen at the beginning of the very next poem. “It was foolish to hope. He prayed / for rain but the heavens let fall / Tithonus instead, / whose every atom / was transfigured into a wasp.” Here we have a straight statement of the poet’s initial helplessness — and then a reference to the Greek mythological figure, Tithonus, whose divine lover, Eos, asked Zeus to bestow immortality on him but forgot to ask for youth as well. Thus, according to some versions, Tithonus was transformed into a ancient cicada who calls out eternally, begging for death. The analogy to a stroke victim’s situation is more than apposite. The wasp at the end of this excerpt symbolises the debilitating effects of the stroke throughout the book and, to a lesser extent, the sheer senselessness of strokes. It’s not as if anyone “deserves” one. It’s like being struck down by one of those arbitrary gods who had nothing better to do on the day. At times the wasps are particularly vindictive: “ a wasp performs a pig Latin liturgy / on the tabernacle / that is his tongue.” And we know how important the tongue is to a poet. The distancing provided by the intermittent third person viewpoint seen here is also part of the poem’s overall effect. It contributes to the “objective” part of the “objective correlative”. And helps to avoid any self-pity. A further contributor to the work’s overall tone is Deane’s use of literary allusions. His dog, apparently, is called “Caligula”, Robert Lowell’s schoolboy nickname, and so provokes a quotation from Lowell’s poem, “Skunk Hour” : “My mind’s not right.” Earlier on, a “black swan / of a woman” (his Somali nurse?) reminds the poet of Yeats’ “The Wild Swans at Coole”. Both allusions are lightly made but they also help to connect the poem with the mainstream of poetry in English. Year of the Wasp is not at all a “confessional” poem about someone’s reversal of fortune. A lot of the poems here are short, free-standing ones which contribute only obliquely to the whole while serving to ramify and widen the work’s overall intent. A fine example is seen in the opening four lines of a section which begins: “The way the setting sun shadows / a stand of pines that had no right / to colonise the river bank, / but did and do and shall remain”. Some readers may feel that, in these moral/political reflections, Deane has drifted somewhat from his first preoccupation with stroke and recovery. The poet’s response would probably be that the intensity of his suffering has forced him to look beyond himself and to now see his experience in a wider context. The stroke has not diminished his previous moral concerns; rather it has intensified them. 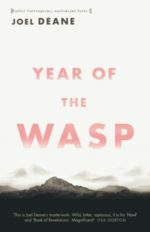 Year of the Wasp is a brave book, packed with metaphorical energy, and repays multiple readings. GEOFF PAGE is a Canberra based poet and critic. He edited Best Australian Poems 2015 and his latest collection is Plevna, a verse biography, (UWA).